We’re excited to add Synergy Logistics to our Fulfillment Provider Program, offering greater shipping and fulfillment benefits to existing and new customers. 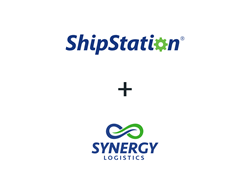 ShipStation, the leading web-based e-commerce shipping solution, today announced the addition of Memphis, TN-based Synergy Logistics, a division of Synergy ReCommerce, to its Fulfillment Provider Program. Synergy Logistics offers warehousing, cart integration, fulfillment, inventory management, reverse logistics, returns, and special project solutions. Vendors chosen to participate in the ShipStation Fulfillment Provider Program offer a wide range of specialties including geographic coverage, verticals, and product niches. Synergy Logistics offers strong expertise in kitchen electrics, home and garden, sporting goods and games, and health and beauty categories. Online sellers who choose Synergy Logistics will have access to the ShipStation features and benefits they know and love, as well as additional options. This includes Automation Rules and Product Defaults, saving time for customers by providing the ability to automate: the choice of shipping carriers to select the lowest cost based on geography, product type, and weight, as well as the returns process, international shipping forms and more. Additional ShipStation features include a free USPS shipping account (savings of $15.99 per month for U.S.-based customers), which includes discounted USPS rates; batch printing of more than 500 shipping labels at once, wirelessly, from a large variety of thermal or desktop (inkjet or laser) printers, from a Mac, PC, or mobile device, branded shipping and packing labels, branded tracking pages and a Return Portal. Plus, orders from a variety of sales channels can be imported into ShipStation and managed in one place. Synergy Logistics, a division of Synergy ReCommerce, is located in Memphis, TN and offers complete warehouse and distribution center management. Synergy has over 20 years of experience defining business requirements and developing customized logistics solutions that help expedite their client’s business growth. By partnering with Synergy Logistics, clients are able to leverage a centrally located warehouse and long-standing relationship with FedEx, competitive shipping rates, and 24/7 support. Synergy acts as an integrated part of your team, putting our resources and experience to work - so you can focus on growing your business. For more information, visit Synergy Logistics at http://www.GoSynergyLogistics.com.